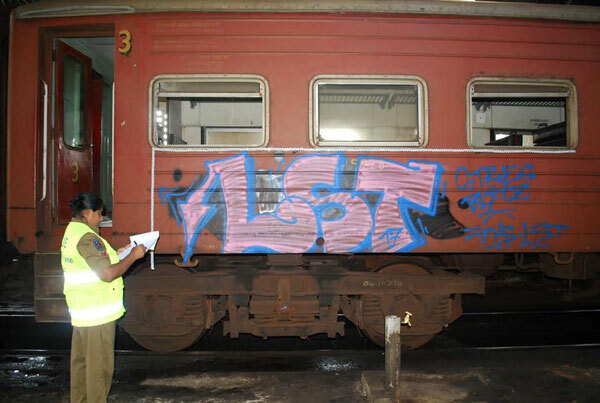 A French couple who had been taken into custody by the Police for allegedly drawing pictures on the railway compartments was produced before the Galle Chief Magistrate on Saturday and was remanded till tomorrow. The Police told court that the suspects, Gousset Gaeten and Leal De Sousa had caused a damage of Rs.64, 440 to the Railways Department. The suspects, who entered the Galle Railway Station without permission on Friday evening have allegedly drawn pictures in a passenger compartment, when the Railway Security Service Officers arrested them. its called "graffiti" not pictures ! Are they permitted to do these things in their own country ? What do they think they are ding. Why not action is taken against those who draw party symbols on highways during elections. 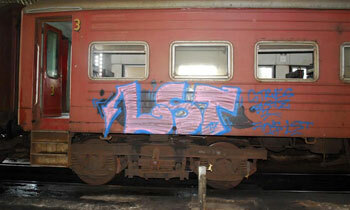 Its called graffiti and defacing of public property . They must be fined of course. But the same fines should be given to all Sri Lankans who deface public property such painting politician's names and defacing rocks at beautiful waterfalls and such places. We Sri Lankans knew how to do graffiti hundreds of years before these foreigners. We can teach them a thing or two.The Mirror Wall in Sigirya is full of graffiti and that Mirror Wall AND is graffiti are now protected cultural artifacts. One man's meat is another man's poison. "The law must apply to all" Indeed: Its called graffiti and defacing of public property . They must be fined of course. But the same fines should be given to all Sri Lankans who deface public property such painting politician's names and defacing rocks at beautiful waterfalls and such places. "The law must apply to all" Indeed: Its called graffiti and defacing of public property . They must be fined of course. But the same fines should be given to all Sri Lankans who deface public property such painting politician's names and defacing rocks at beautiful waterfalls and such places. We Sri Lankans knew how to do graffiti hundreds of years before these foreigners. We can teach them a thing or two.The Mirror Wall in Sigirya is full of graffiti and that Mirror Wall AND is graffiti are now protected cultural artifacts. One man's meat is another man's poison. Ha..Ha..Ha... they must be "Lunatic Artist". Give employment them in Cinema Halls to draw cut-outs. If Weerawansa is out - he might say - meka anthar jatika kumandaiak.... Ha..Ha..Ha..
Me train eka haduvata passe 1960 indan gaapu palamu theentha paara. I salute the 2 french men. Haha..!! that drawing or graffiti whatever it is...looking much much better than the red color and covers the status of the train..! !